is Part Three of “Entering the Shift Age”. It should be the second eBook to read. On 01-01-10 – an interesting ‘digital date’ - I named this decade the Transformation Decade and it seemed to resonate to people around the world. 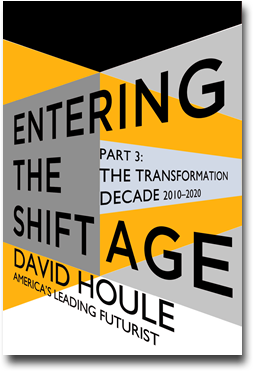 eBook 2 discusses The Transformation Decade, which spans 2010-2020 and which is and will be one of the most transformative decades in human history. It is the first full decade of The Shift Age, and with it comes amazing changes and trends. The definition of “transformation” is “ a change in nature, shape, character or form” so this is the decade that humanity and most of its’ institutions will change their nature shape, character and form. In this eBook we will look at all the transformation occurring, why this decade is the first decade of 21st century thought, the collapse of legacy thinking and then a look ahead to the trends and forecasts from now to 2020. This is a perfect read following eBook #1 or as a stand alone eBook if you are simply interested in better understanding the change going on around you and what some dominant trends will be this decade. © David Houle & Associates 2001-2012 All rights reserved.